· Poor personal hygiene, untreated pressure sores, or health problems left untended. · Missed meals or medication, or unsanitary, unsafe, or dirty living conditions. · Emotional changes such as fear, anxiety, withdrawal, anger, depression, or isolation. · Confusion, disorientation, resignation, or unwillingness to communicate. · Injuries like cuts, bruises, or burns in unlikely places and with dubious explanations. · Pain when touched or unwillingness to be touched at all. · Not being the only person with access to important documents, bank accounts, or post. · Carer acts with indifference, refuses sympathy, or describes the person as a burden. It is important to remember that not all of these signs can be proof that abuse is taking place; some people may prefer to have a carer manage their finances, and others may experience social withdrawal or confusion due to a medical condition. 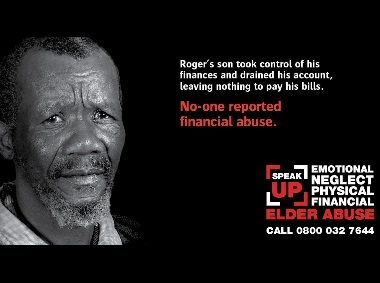 However, members of the public who are concerned that an older person may be a victim of abuse can contact Crimestoppers’ Elder Abuse Helpline on 0800 032 7644 or visit the website at https://crimestoppers-uk.org/essex-elder-abuse. Speaking at the helpline’s official launch, Crimestoppers Chief Executive Mark Hallas said, “We all have a duty to protect our elderly community and this should involve speaking out if there is any suspicion that they are suffering abuse”.